Character creators can be a good way to help you bond with your protagonists, but sometimes they can go a little wrong. 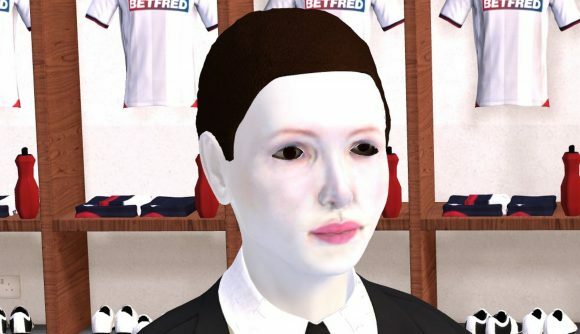 And never have I seen an example of that more clearly than in Football Manager 2019, which serves up a default female manager who looks like something out of a horror movie. Last night, one player posted their findings to Twitter, showing off the default male and female character models in the sports simulator’s most recent outing. The male model looks a bit gormless, and has a slightly dodgy facial hair thing going on – something of a cross between a goatee and a five o’clock shadow. But it’s his female counterpart who’s truly disturbing. Apart from a dash of lipstick, some rouge, and the dark, soulless pits of her eyes, the default female manager is comically pale. She’s like the lovechild of a businesswoman and a mime, with skin whiter than the shirt she’s wearing or the painted bricks that make up the changing room behind her. She’s even paler than me, and I’m naturally ginger. We had Dave, our resident hardware/Football Manager expert do some digging, and he found that this is indeed what the game serves up as a default character. For some reason, the game’s base setting has the skin tone slider as far over as it can go, although there’s a slight visual bug which means that adjusting it forward and back doesn’t offer quite the same monstrous results. Getting closer to the horrorshow reveals even more issues, from the model’s sunken eyes, to her void-black haircut, to her lack of eyebrows, to the fact that her feet are a normal flesh colour while her hands and face are ghostly white. Thankfully, a few adjustments in the character creator should fix many of those issues, but I can be damn sure they won’t help with the nightmares I’m sure to be having tonight.